The Scarborough Players take on the classic story, Inherit the Wind, by Jerome Lawrence and Robert E. Lee, a tale that evaluates the ongoing debate between the theory of evolution and Christian dogma. This fictionalized dramatization of the Scopes “Monkey” trial in 1925 puts a school teacher, Bertram Cates (Josh Mott), to trial for teaching his class Darwin’s Theory of Evolution which violates Christian state law. The story boils down to one debate, one that’s still argued out to this day, progressive science vs. the Bible. The focal point of this story exists between Matthew Harrison Brady (Mike Woodbridge), a three-time presidential candidate and attorney who lives and breathes the words of the Scripture and is sworn against the plague of “evil-utionists” and Henry Drummond (Greg Nowlan) who was once Brady’s friend and political colleague, now staunch Darwinist and advocate for modern and evolved thinking. As these two represent the vocal aspect of this debate, the rest of the Hillsboro citizens as well as Cates and Rachel Brown (Cassandra Guthrie), fellow schoolteacher and Cates’ friend, also the minister’s daughter, stand by and shout their support – in the form of hails and hossanas – for the rather biased side they support. Accompanying me to this performance was my housemate Sara, a reformed Catholic now proud Atheist, who has been caught up in this debate for many years of her life. Her background led to the retelling of this story, affecting her in a more personal way than it did for me. Where I was raised in a more progressive environment, the utterly backwards belief of “because the Bible says, therefore it must be so” approach to everything dragged on my frustration levels. Watching the second half of the performance which dealt with the the trial and the round about arguing in which Drummond places Brady on the witness stand as the biblical expert – when all of his scientific experts were denied the chance to testify – left me increasingly aggravated. Sara pointed out the young boy Howard (Cara Robinson), one of Cates’ students, and his progression towards free thinking and how she admired his progression throughout the story. From the beginning where he shoved a worm into little Melinda’s (Sarah Unan) face declaring that evolution taught him that humans evolved from the primordial goo that also contained other earthly creatures like worms, to his testimony during the trial explaining the lessons he learned from Cates and how such a revelation wasn’t appalling to him; Sara saw him as the representation of modern free thinking, and her world view embodied. The performance is incredibly well done, the passion and frustrations ring true to the audience because it is still a very relevant debate today. The performance is bound to spark heated debate and discussion and therefore, the cast and crew have succeeded in their goal. 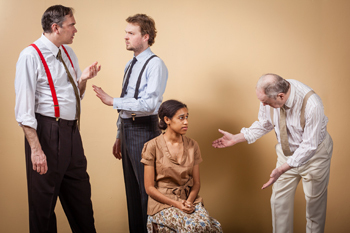 Inherit the Wind is playing at the Scarborough Village Theatre (3600 Kingston Road) till April 20, 2013. Performances run April 4-6, 11-13, and 18-20 at 8 pm with a matinee showing on April 14 at 2 pm. Tickets can be purchased online or by phone at 416-267-9292. Photo of Greg Nowlan, Josh Mott, Cassandra Guthrie, and Mike Woodbridge by Sean Howard. Excellent critique & so inspiring for Scarborough Players. Thank you so much.